We are very proud to announce our support of Stone Flowers, established in 2011, the Stone Flowers’ is a joint music project between Freedom from Torture North West and Music Action International (previously known as Musicians Without Borders), a local-based international music charity supporting men and women who have been subjected to and witnessed torture and organised violence and atrocities that most people find hard to conceive. Freedom from Torture supports survivors of torture to rehabilitate through provision of psychological therapy and practical legal and welfare advice enabling them to gradually reduce their severe and complex trauma symptoms. Music Action’s Professional Music Facilitators provide support in improving their emotional health and well-being through music. The Stone Flowers music group is made up of survivors of torture who come together to create and play music, deliver public music performances and record CDs. Donate via our secure online collection page and help us make some change. We aim to raise £5,000 which will go towards the support of a new Beginners Group of 20 participants (10 male and 10 females), who will be supported by professional musicians to develop personal expression and creativity and discuss themes and important messages the survivors wish to convey through collaborative song-writing. Click on the button to donate via our secure online collections page. If you're a UK tax payer, Gift Aid is also available. Thank you. 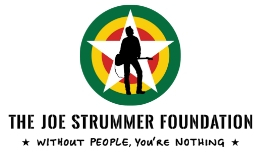 "Thank you for your work, RIP Joe Strummer." "Good luck and I hope you reach the target." "Let's take care of each other." "Good luck hitting the target for this worthy cause." "Many thanks for all that you do." Survivors will be supported to translate their views, experiences and emotions into original music that will draw on the diverse heritage of members’ home countries. Some members will use their voice in music-making, while others develop instrumental skills. Participants will also have 2 costume-making sessions, in preparation to deliver a free public performance at Manchester Central Library. We anticipate an audience of around 200 and aim to reach out to new audience members who will not have heard of our work and who may not have had the opportunity to meet refugees or asylum seekers before. The Stone Flowers Progression Group aims to record a third CD in 2017 which will include new songs written by the beginners group, dependent upon securing financial support for this. This process will result in a unique cultural and artistic exchange between survivors who share their diverse languages, musical and cultural approach to creativity via interpreters and music facilitators. Thank you, please help make a difference.